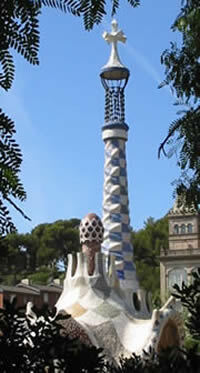 Gaudí's Works are more than what meets the eye! This Private Half Day Tour of Gaudí's works will take you past the first impressions to a more technical approach of Antoni Gaudí's construction techniques and their underlying principles. 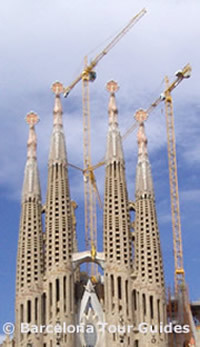 The Sagrada Familia (Holy Family) Church, on which Gaudí worked for 43 years, will be one of the main stops of this tour as it incorporates all his ideas (and ideals). The itinerary will also take us to the Güell Park, where Gaudí's architecture blends into nature and where fantasy accommodates practical concerns. An unexpected place with a fairy tale feeling! Your Tour Guide's comments will also evoke Antonio Gaudí's personality and life story, at least as controversial and original as his buildings. Profoundly devout and religious, he led an intense mystic life. The feel: A highly focused tour for those who want to get a closer look at Gaudí's works though still interesting to the non-initiated, as our Tour Guide will highlight the aspects that interest you most: technical, artistic, personal, social or religious. These amounts are for the whole party (1 to 2 and 3 to 6), not per person; they include: vat (taxes), private transport by Mercedes sedan or minivan with separate driver and a licensed tour guide for up to 4 hours. Prices do not include: your entrance fees at optional interior visits. On the Gaudi Tour: Sagrada Familia : 18 Euros per person (or 16 Euros for students until 18, 14 Euros for seniors over 65; free entrance for children up to 10 years old and our guide) and Park Guell : 7.50 Euros per person (free admission for children under 6 years old and our guide). We are updating our form server. Please just send us an email with the information asked in the form below or if you only want to make an inquiry rather than a reservation. The cranes have been there for so long they have become part of the landscape. If four of these spires already look impressive, imagine 18 of them! These are over 300 ft. tall; the main cupola will be 510 ft.